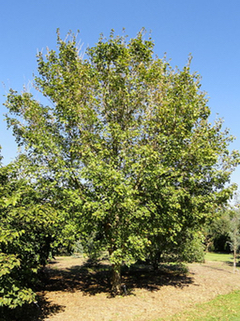 This Tree in Colorado: The Miyabe Maple, with its upright-oval to rounded shape, makes an ideal specimen or shade tree. 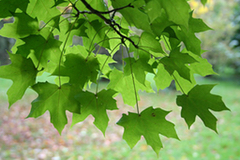 Its green leaves turn a pale yellow in the fall. The species prefers moist, well-drained soils. Landscape Use: The tree can grow to 60 feet in height and 50 feet in width, so be sure to give the tree plenty of above and below-ground space to grow. Can work well as a street tree. Hardiness: Zone 4-8. Has shown good tolerance of temperature extremes as low as -30° F.
Leaves: Mostly 5-lobed, with dark green above and olive green on the lower surface. Leaves turn rapidly to pale yellow in the fall and fall shortly after. Flowers: Greenish-yellow, borne in slender-stalked pyramidal corymbs. Bark: Grayish and scaly in long strips. The Morton Arboretum, “Miyabe’s maple,” 2015.